Server counts are steadily declining, but that’s not because they’re no longer being used. Quite the contrary; servers are still an essential hardware component within data centers. But as technology like the cloud and virtualization continues to drive server consolidation, the few servers your enterprise uses will carry even more responsibility. 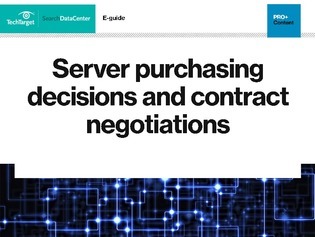 In this vendor-neutral E-Guide, learn how to make the right server choices for your data center. You’ll find out how to step through the buying process from start to finish, and how to properly negotiate and fine-tune your SLA contract details to maximize your investment.